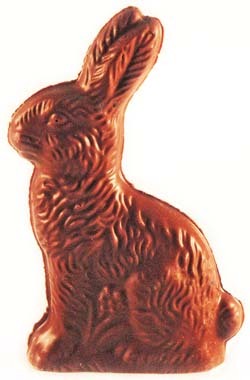 Nostalgic, solid chocolate rabbit. Just like back in the day! Very detailed. Made, of course, with Dorothy's rich, Swiss chocolate. From Anonymous of Lebanon, Pennsylvania on 4/2/2018 . From R Lloyd of Puyallup, Washington on 4/2/2016 . From Anonymous of Ballwin, Missouri on 3/31/2016 . From Margaret J Drummond of Savannah, Georgia on 3/29/2016 . From Bob Feltz of North Kingstown, Rhode Island on 3/17/2013 .